Are Air Conditioning Tune Ups Important? Even though most homeowners want to keep their air conditioners in the best condition possible at all time, most of them won’t have their AC systems serviced until they encounter a major problem. 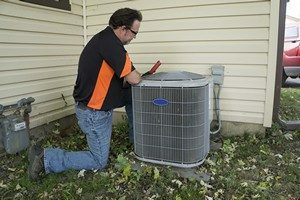 Before your air conditioner stops cooling your home or starts costing you more money each month, it can be easy to assume that it’s running fine. However, if you wait until your air conditioner needs major repairs before you call a professional for assistance, you’re only costing yourself money. At Stay Cool Heating and Air, our professional Summerville air conditioning contractors recommend that you have an air conditioning tune up performed at least once each year, preferably in the spring, before you begin cooling your home on a regular basis. AC tune-ups are an excellent form of preventative maintenance: they’ll prevent you from needing emergency repairs when you’re relying on your air conditioner the most, and they’ll keep your energy costs as low as possible. If you take a look at the benefits that air conditioning tune ups can provide you with, their importance becomes very apparent. Why Do Air Conditioners Need To Be Tuned Up? Throughout the hotter months in Summerville, your air conditioner is constantly under a tremendous amount of stress. If your AC were a car, you’d be putting an average of 27,600 miles on it per year, so making sure that it’s properly maintained is the only way to keep it functioning well. Without regular HVAC maintenance, tune ups, and inspections, the machinery of your air conditioner can decay very rapidly. Even a small problem like dust build-up in your AC’s ducts can lead to significant drops in your air conditioner’s efficiency, which will raise your monthly energy costs. AC tune-ups will save you money on your energy costs and on future repairs, plus, they’ll extend the lifespan of your air conditioner. If you have an air conditioner tune-up performed each year, it will be much easier to keep your Summerville home cool and comfortable, and you won’t be paying nearly as much to do so. Why Should Tune-Ups Be Performed Annually? After about a year, the coils in your air conditioner will need to be cleaned and various motors and smaller pieces of machinery will need to be worked on. Without this attention, your Summerville home’s energy efficiency will sharply decline, and your air conditioning system may even need of hundreds of dollars of repairs in the future, all of which could have been prevented. An air conditioner that receives annual tune ups will have a much longer lifespan, run much more efficiently, and need fewer repairs throughout its lifetime. If you’re looking for air conditioning tune ups in Summerville, call Stay Cool Heating and Air at 843-819-5392, or fill out our online request form.